The ionosphere, usually defined to extend upward from about 80 km, is the region of the Earth’s atmosphere where concentration of ionized particles becomes sufficiently high to become easily observable. Below 80 km absorption of solar radiation by the atmosphere above decreases the probability of a neutral atmospheric molecule being ionized and results in negligible concentration of ionized particles. At altitudes higher than about 400 km, the density of neutral particles that are subject to ionization decreases substantially and absolute concentration of charged particles gets smaller with altitude. The author is very thankful to Dr. T. Fuller-Rowell and Dr. O. de la Beaujardiere for their interest in the work described here, encouragement, and guidance. 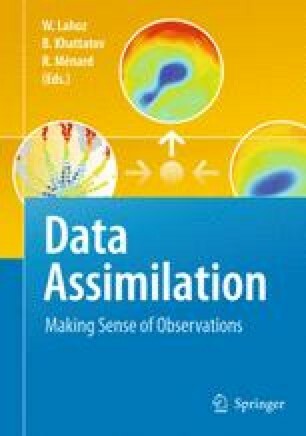 A number of skilled computer scientists and software engineers helped to develop the numerical model and data assimilation scheme described here in a short time. GPS Solutions Inc was an integral part of developing the positioning augmentation service and provided the positioning engine. This work has primarily been funded by the US Air Force Research Laboratory in Hanscom, MA.